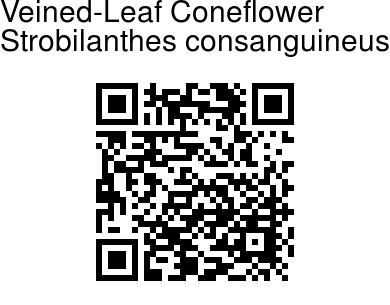 Veined-Leaf Coneflower is an erect shrub, 1-2 m tall. Leaves are opposite, 10-17 x 5-10 cm, nearly hairless, toothed or rarely entire, ovate-lanceshaped, tapering at tip, wedge-shaped at base, more prominently toothed; main nerves 7-8 pairs, nearly parallel. Flower-spikes are more slender, more interrupted, nearly hairless, 5-8 cm long, short-stalked. Flowers are white, with bluish petals, in paniculate spikes; bracts larger, subulate, hairy, tapering; bracteoles linear, short. Calyx .6 cm long, the lobes slender. 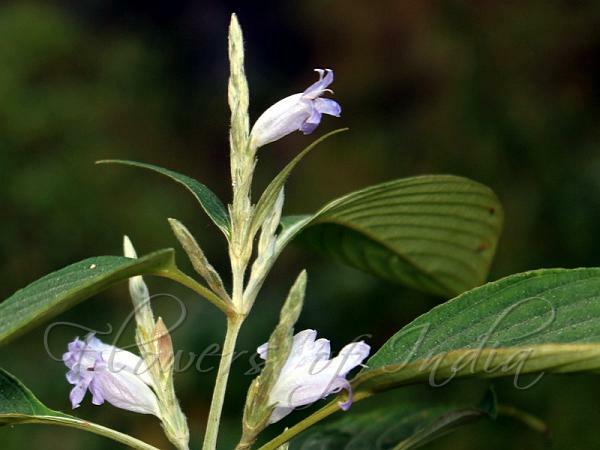 Flowers are 1.5 cm long, hairless without. Stamens 2 fertile, hardly monadelphous, though sometimes connected at base; anthers oblong, muticous, 2-celled. Capsules are about 9 mm long; seeds much compressed, hairless, densely hairy when wetted, with a basal areole. Veined-Leaf Coneflower is endemic to Southern Western Ghats. Flowering: October-February. Identification credit: Prashant Awale Photographed at Charmadi Ghat, Karnataka.